With Halloween just around the corner most people must be busy planning their Halloween parties and thinking up of some cool Halloween decorating ideas to make their event an affair to remember. The time for trick and treating is near so stock up your candy cupboards and check out these scary, chilling and intimidating ideas to get a few shrieks out of your guests! 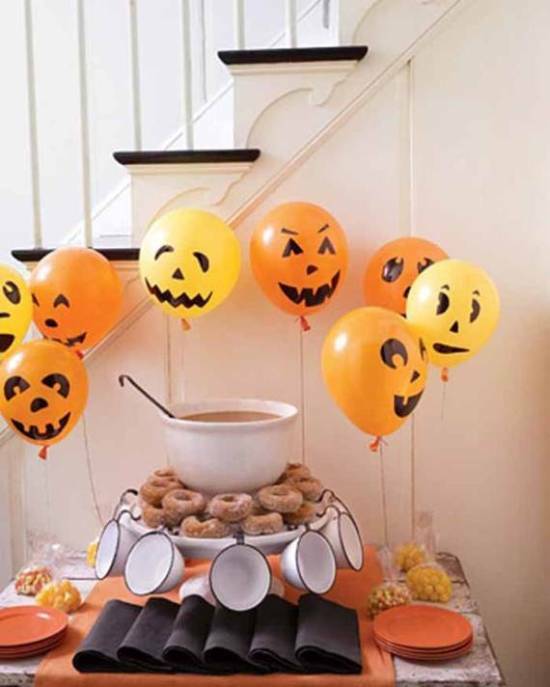 For those planning to spook up the guests before they even set food within the door, this cute attempt at scaring people off is a great Halloween decorating idea. It’s ideal to be used in instances when the party is for the kids or for adults. This is one Halloween decoration which is pretty easy to replicate. Simply make use of white cardboard sheet or Styrofoam material and cut in those eyes and garish teeth and attach it to your door, this gets you full points before the party’s even started! No party is complete without a yummy cake. 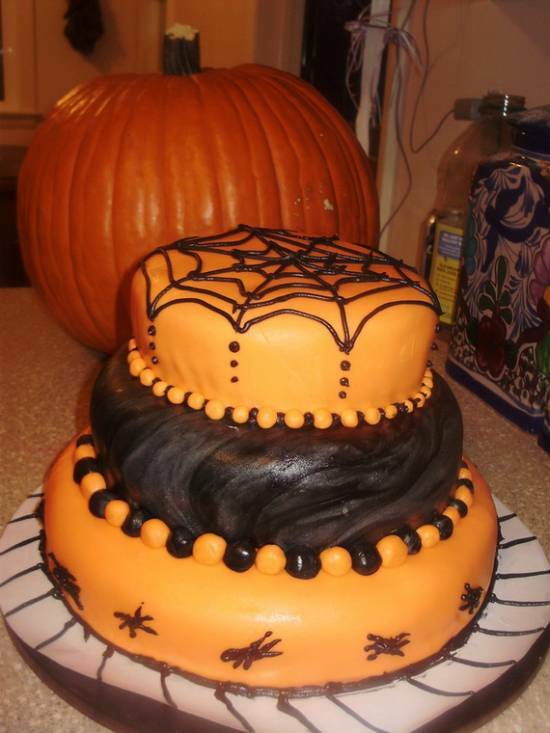 Check out this classic fondant cake inscribed with a spider’s web. Can’t bake, have it ordered. These days most cake makers are willing to make cakes based on your ideas. If you want something a bit more menacing you can brainstorm with your baking expert and create a masterpiece all of your own! 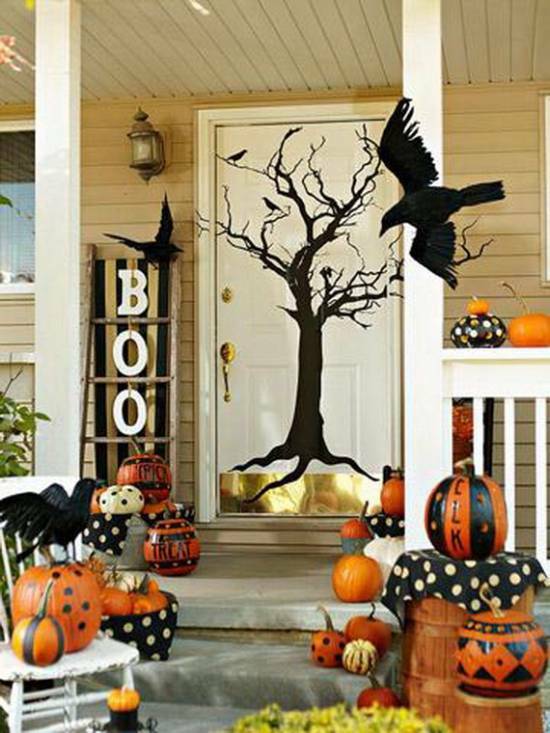 Planning a party in your garden, check out this innovative style of decking the stairs in a spooky way. 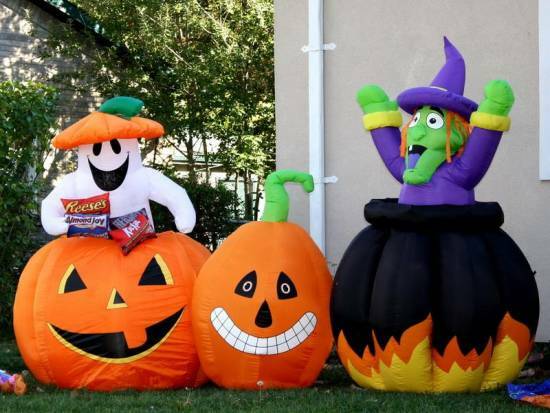 The spooks lined up to welcome you in this yard are pretty cute and not really scary, but they do add up to the Halloween feel. You too can create these little monsters using different materials. Take inspiration from the picture and go about creating your own gang of ghouls! 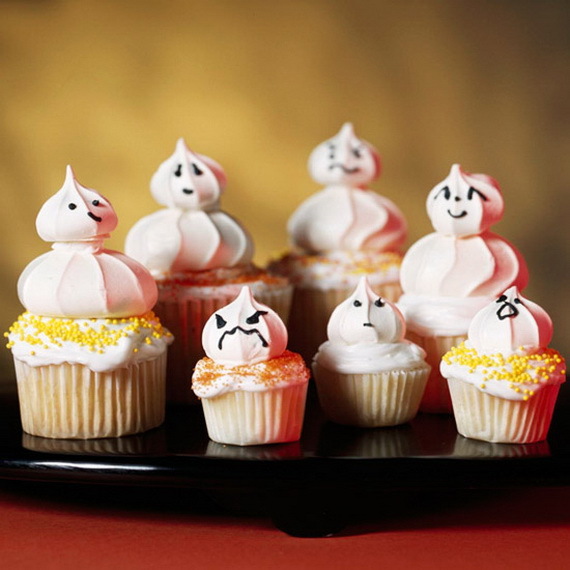 Check out the spook factor of these cutesy cupcakes which your kids and older guests are going to love. These deliciously creamy little spooks are just so adorable, wonder who might want to get a bite out of these. A fabulous way of keeping those bottles of beer or wine chilled for your guests. The people are going to love this super smart idea. 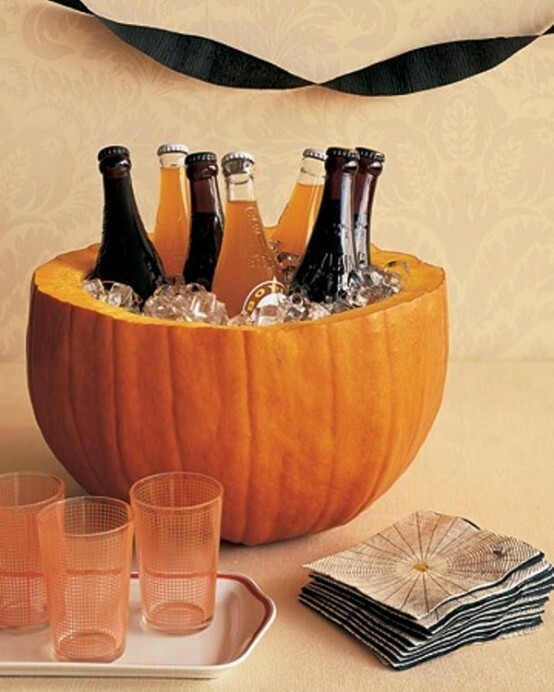 Get hold of a huge pumpkin clean it inside out and use both halves to be filled with ice and a few beer bottles tossed in. 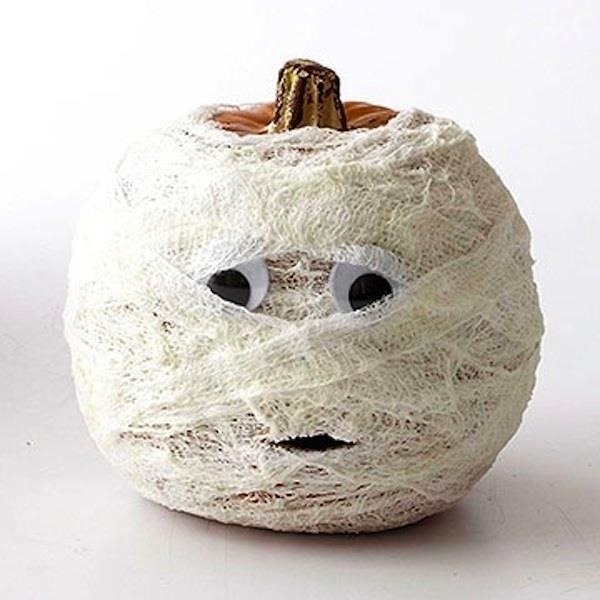 Also take a look at the web printed on the tissues, bring out your creative genius this Halloween with this delightful Halloween decorating idea. Balloons are a staple for any kid’s party and these cleverly crafted balloons are sure enough to win all the little hearts. Catch hold of a few colorful balloons, a nice fat marker and start creating your own little spooks. Attach them on the walls or simply let them rest on the refreshment table. 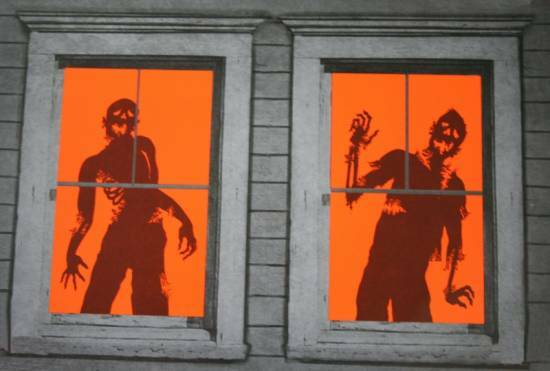 These weird and eerie little things adorning your walls are a great way of upping the chill factor at your Halloween party. These are super easy to make. All you need is some black chart paper and a few willing hands. 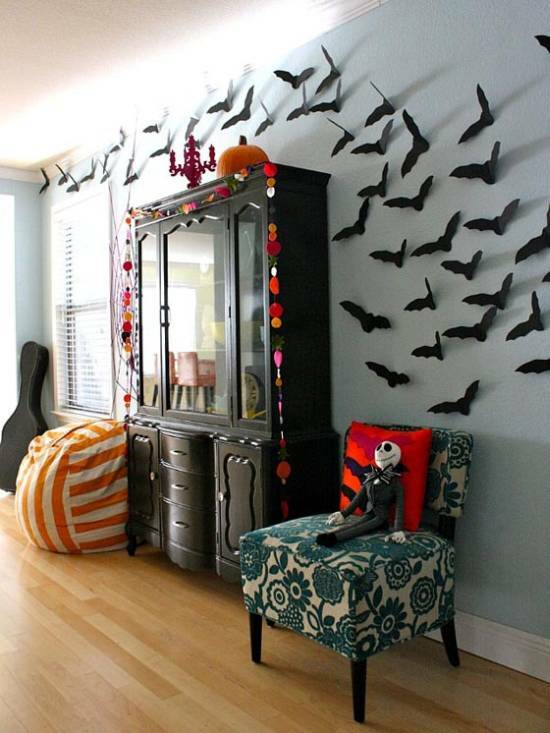 The bats made, simply attach them to the walls on the day of the party and add a true Halloween feel to your homes! For a truly inspirational scare, you can try using this tactic in your bathrooms. 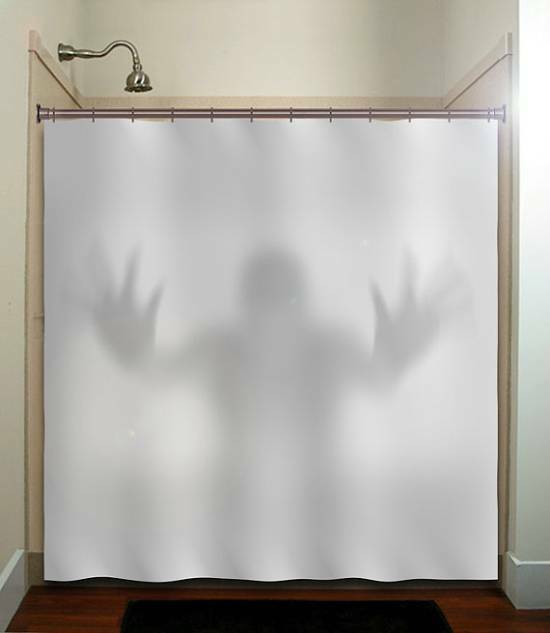 Simply place a shadowy caricature behind the shower curtain and spook all those who visit the loo. Why leave the bathroom spook free on the day when all things weird and scary rule! Though these cute little things are in no way scary, they do add a certain charm and appeal to your Halloween decorations. Decorations such as these can be bought in stores which specialize in Halloween items. Or if you are creative enough and have the time you can simply use some fabric and create sweet little spooks of your own. Planning an early evening event, check out the beautifully decorated dining table. 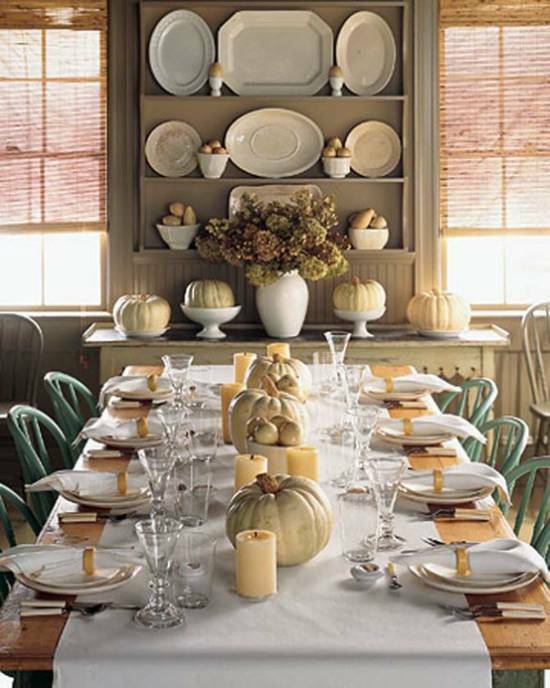 The pumpkins add a real zing to it and paired with the lovely white candles give the room a fairy tale kind of look which is truly inspiring and appealing. Go on and stun your guests with this classy decoration. 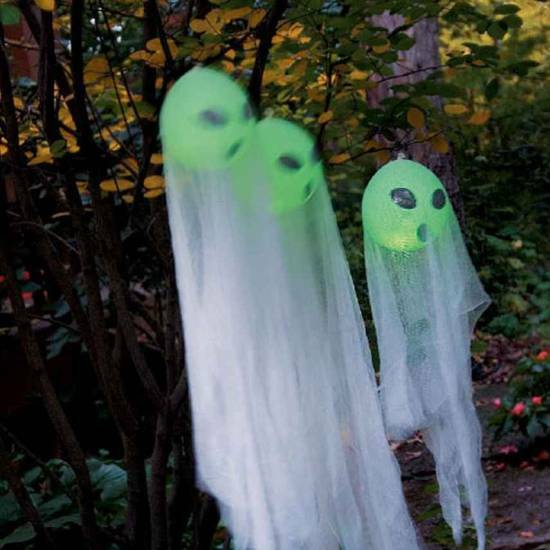 Check out the creative way the balloons are decked out in white gauzy material to give the spooky ghost effect. Hang these at the door or the trees in your yard and up the chill factor. This is a really inspirational way of spooking your guests from afar. The ghosts etched on the windows are a great way of scaring your guests and they really do have an uncanny and spine chilling effect on those who are truly superstitious! If that is exactly what you consider yourself and your brood, this is a great way of bringing a smile on the faces of your guests. 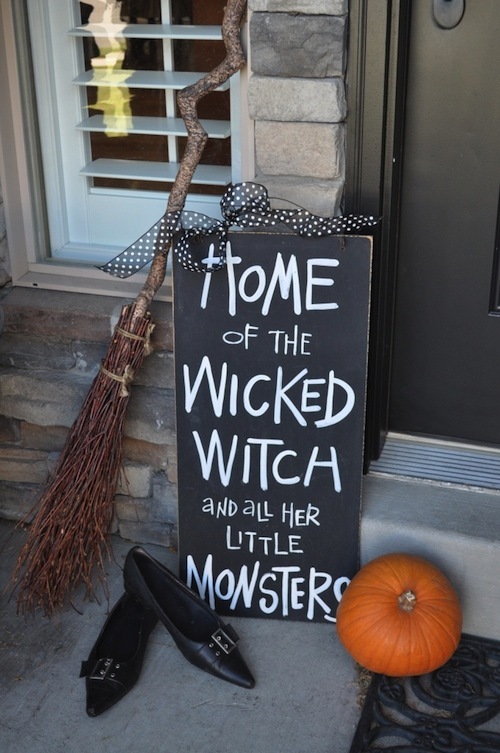 The witch shoes at the door along with the broom and a pumpkin are a real authentic Halloween touch. No Halloween party is complete without jack o lanterns. Check out this one made to look like a zombie and covered in gauze. It looks super cute and sassy and will surely elicit smiles from all those who enter your homes. Check out this classy show piece for Halloween, one which can be used year after year and placed in the attic cupboard till the time of spookiness comes back. 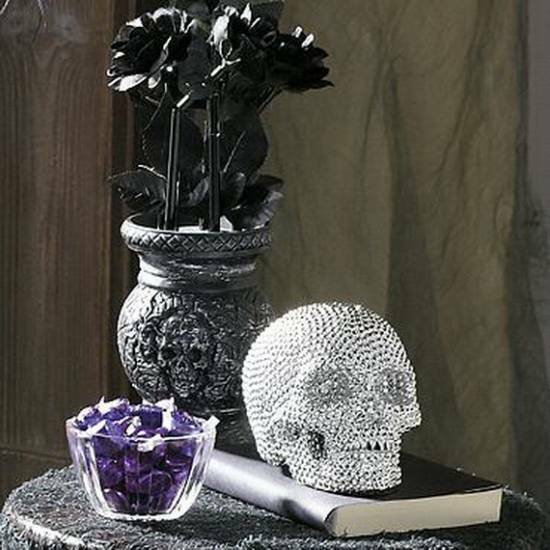 If you can afford one, invest in it and bring out the bling factor to your Halloween decorations. Halloween is incomplete without candles. Check out these lovely candles dressed in black lace for a festive and sophisticated look. Put some new your stair case and doorsteps to enhance the spooky mood! When you think of Halloween, you think of black cats and witches. Welcoming your guests with this cutesy little kitty cat at the door is surely going to make your Halloween decoration one of a kind. Get a pumpkin and start getting creative. It’s a fun and catty way to welcome your guests. 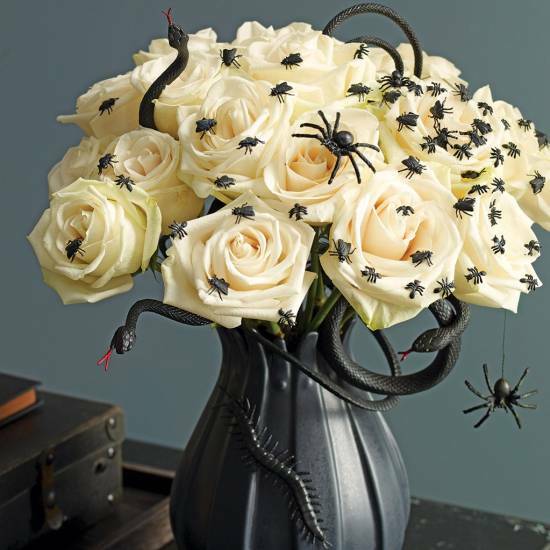 If your taste runs towards ghoulish and creepy for Halloween ideas, then this garish display of silk roses crawling with black insects would surely appeal to your zany sense of humor. Invest in a few silk roses and attach these black insects readily available at any trick or treat store for a truly uncanny and weird look. You can create a visually stunning Halloween decoration for your home using any of the above mentioned ideas. 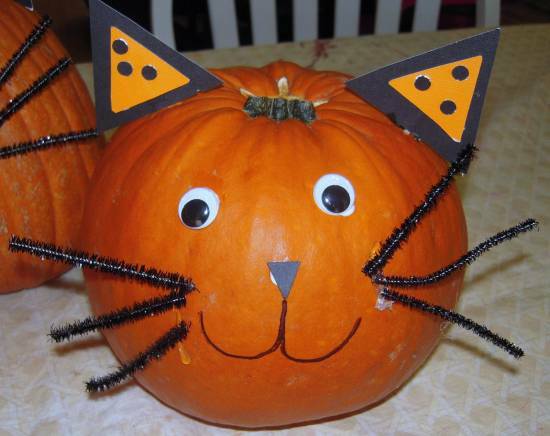 Check out the funny and ghoulish pumpkins, witches and black cats and chose the ones which catch your fancy. 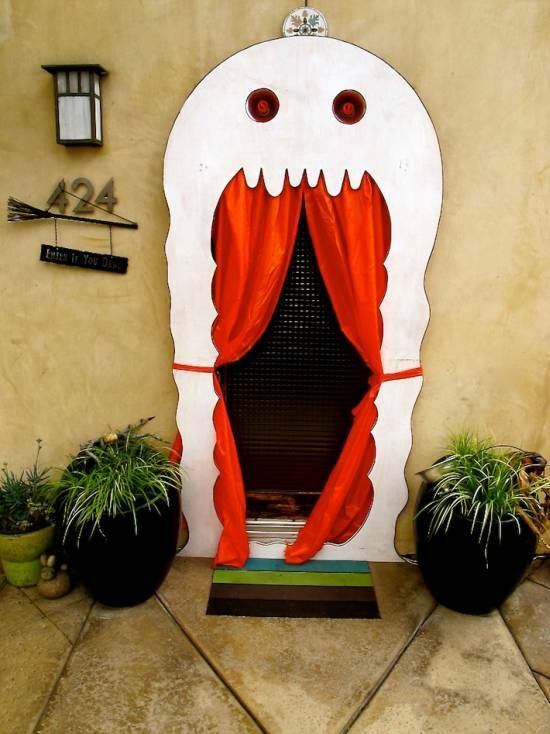 Decorate your entrance to wow your guests with these comical, peculiar and weird Halloween decorations.